I stand before you, honourable Members of Parliament to exercise my constitutional obligation as stipulated in Article 84 of the Constitution of the Maldives; to address this esteemed Majlis on the current state of the nation and to present measures for its further development. As honourable members may already be aware, I took the oath of Office at a critical juncture in the history of the Maldives; where the political landscape was in turmoil and the country’s reputation marred. Our social fabric was torn and in disarray, and the political opposition and scores of citizens working for reform either were jailed or trapped in unlawful sentences. However, today, we’ve re-embarked on our national journey towards democracy, restoring the basic rights of citizens including their constitutional right to pursue political activity and political dissent, leading to a rise in people’s contentedness. For this, I thank Almighty Allah. The people elected me in the hopes of moving away from the culture of corruption and kleptocracy that was poisoning our nation, and we’ve steered the vessel of the nation towards a life of dignity and integrity for every citizen. It was the desire for justice and fairness in place of systematic injustice and discrimination that drove Maldivians to elect me as their President; a need to crack down on the culture of fear in politics and, instead, establish peace and stability within our society. I recognize that I was elected on the collective hopes of citizens to raise their families in dignity, to lead empowered and meaningful lives removed from fear. I was also elected in the hope that basic needs which have not yet been met; such as affordable housing, clean water and adequate sewerage would be fulfilled. I wish to take this opportunity, to reiterate my assurance that the Government will not forget, or falter in our efforts to deliver on our promises to the people. Since my inauguration, my Government has operated under the shelter of the constitution. We run a lawful government. My Government is committed to govern within the confines of the constitution and the laws of the land. Every aspect of administering this State is geared towards ensuring the rights of the Maldivian people, establishing social justice and improving livelihoods and well-being. Many changes to the administrative framework of the Government are required in order to realign the State to function as a democracy. The past four years saw this esteemed Majlis stripped of its ability to carry out its constitutional duties. In order to reform the democratic system, the work of the People’s Majlis must be improved and strengthened. To guarantee the rights of the people, and assure them that justice and freedom will prevail, reforming the judiciary is one of, if not the most important and pressing issues to be addressed. The courts and judges must take the road to reform if we are to see any peace and stability in this country. It is apparent that at the time of my inauguration, there was not a single State organ free from the endemic corruption that maligned our nation. There was not one State organ in this country that had not endured varying degrees of deceit and embezzlement. The country fell into this lamentable situation not because of an absence of anti-corruption laws and regulations but because of inaction. Institutions responsible for investigating and prosecuting cases of corruption carried on as if the status quo was the norm. By falling to their knees in the face of systematic misappropriation and theft, the roots of corruption took hold across the country. By either taking only cosmetic measures or turning a blind eye against those who pilfered the coffers of the State, those institutions in turn became enablers of corruption. The Presidential Commission on Corruption and Asset Recovery established to reclaim embezzled assets and money has convened its work and has thus far retrieved a number of documents regarding the MMPRC corruption scandal. The Commission has commenced investigations with technical assistance from foreign experts, and has the full support of a number of government agencies from various countries. The Commission is also hard at work on uncovering the truth of cases where embezzlement and corruption of State funds have occurred. The goal is to recover these funds, and bring to book those responsible for these acts of fraud and theft in accordance with the law. The Commission on Investigation of Murders and Enforced Disappearances is currently focused on seeking assistance from forensic experts and Artificial Intelligence experts to investigate photos and videos gathered as evidence, and achieve tangible results. The Constitution of the Maldives clearly states that Islam is the religion of all Maldivians; a stipulation that the Government has integrated into its policies. All plans and strategies of the State will concurrently be aligned with the true doctrines of Islam. With the Grace of Almighty Allah, our pledge of allowing access to pension funds to finance the Hajj pilgrimage will soon be rolled out once the Bill submitted to this esteemed Majlis passes. Organized crimes and violence have significantly threatened the daily livelihood of Maldivians. Necessary reforms are currently underway to ensure close provision of police protection required for the peaceful and contented life that Maldivians envision. To this end, neighbourhood police will be introduced; a new initiative that will also be extended to the atolls this year. I am firmly opposed to the infringement of inalienable basic human rights and sanctity of human life of prisoners. An initiative is underway to safeguard the basic human rights of prisoners in accordance with the UN’s “Mandela Rules”. This year, significant steps will be taken to build the strength and competency of the Maldives National Defence Force, the defenders of our national sovereignty. Our goal is to sustain a Defence Force of exemplary discipline equipped with modern skills. Further education and training opportunities will be provided to expand the military capabilities of the Defence Force. The Maldives National Defence Force and Police Service made notable strides last year to uphold independence, peace and harmony in the country. The role played by these two institutions in the holding of a free and fair Presidential election was crucial. I take this opportunity to recognise the actions they undertook to align with the people’s decisions, in the execution of their sovereign duty to uphold democracy in this country. As part of the ongoing efforts to rectify the constitutional framework of the State, my Government has submitted amendments for a number of existing laws that required immediate reassessment. A bill has been submitted to this esteemed Majlis to criminalise unlawful acquisition of wealth. The bill is designed by the Government to raise the penalties for senior State officials implicated in such cases. There will be no allowance for corruption within this Government. 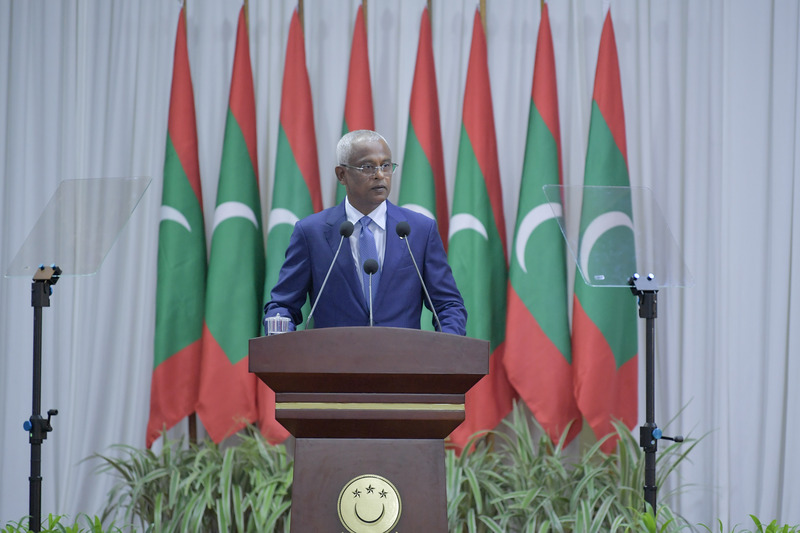 I assure this esteemed Majlis that my Government firmly abides by a policy of zero-tolerance to corruption. The Government is undertaking swift evaluation of 11 laws and regulations that had been amended for the purpose of political gain and to target opposition politicians. 14 additional bills have been submitted to this esteemed Majlis, of which 10 have been ratified. Chief amongst the bills under consideration by this esteemed Majlis is a bill on the protection of whistle-blowers and the Legal Profession Bill proposing to establish a bar association. I call upon this esteemed Majlis to expedite the Bills on Misappropriation of State Property and Funds and the investigation of Unsolved Murders. A bill on Juvenile Justice is due for submission in the first sitting of this esteemed Majlis. Moreover, under the Government’s policy to empower local councils, the Decentralization Act will undergo necessary amendments; a process for which the deliberations of stakeholders and opinions of the general public have been obtained. I have always believed that democratic governance stems from the people. The decentralized system of governance declared in the constitution and meant to empower local communities was however only in name. The reins of power, were in reality, secreted away within the (previous) government’s fists. A number of powers that had been withheld by the former Government have been delegated to local councils. The Decentralization Act will undergo rapid amendments to accord additional powers and authorities to the local councils. The goal is to empower these councils to become financially independent and self-sufficient bodies. Consequently, the role of women in the development of islands will expand rapidly, providing rightful and equal opportunities. As women constitute half of our population, the policies of the Government will be designed to address the grievances of and challenges faced by women. Increasing the number of women in executive positions, and thereby expanding their role in decision-making, is a target of this Administration. I note that 35 percent of my Cabinet of Ministers is women. While fully acknowledging that we have a long way to go in improving the role of women in politics and public policy, the Government will work towards that goal with resolve. We need our daughters to be brought up in an environment ripe with equal opportunities. I want to assure that our policies shall be aimed at eradicating the difficulties faced by women in social and economic participation, financial empowerment and just treatment in the face of the law. To ascertain that the civil justice system is on par with international best practices as in other advanced democracies, a bill on Civil Procedures is being formulated and will be submitted to the Majlis this year. A comprehensive revision of the regulations that dictate statutory bodies is also in progress. The Government intends to submit the amendments during the first sitting of Majlis. Non-governmental organizations are part and parcel of my Government’s endeavour to exercise participatory governance. NGOs are vital checks and balances on State affairs. The Government strongly believes that NGOs are pivotal in strengthening the societal organization of the country and bridging the gap between the State and the people. To broaden the role of such organisations in State governance, the Government is working on drafting and presenting to this esteemed Majlis a Bill on Civil Society Organisations. As the honourable members are well aware, when my Government assumed power, Maldives was in a state of isolationism, alienated from the society of States. But the positive direction that the Government's foreign policy has taken since my assumption of office have been met with acceptance and renewed friendships from the international community. The Government of Maldives has fulfilled and submitted for consideration the procedural prerequisites to re-join the Commonwealth; a union that has historically contributed heavily to our economic development and education. The Government of Maldives is further exploring windows for rapprochement with other entities in the international community, and remedying the diplomatic ties that had been weakened. Consular services available to Maldivians residing abroad, especially students, will be strengthened. Discussions are in motion to sign consular agreements with countries that are frequented by Maldivians and to facilitate smooth visa arrangements with European nations. In a world made smaller by globalization, it is imperative that a Small Island State, such as the Maldives build and sustain its diplomatic capital by cultivating amicable ties with as many countries as possible. With this in mind, the Government is working on opening embassies in Washington, D.C., the United States, South Africa and Russia. Furthermore, a Maldivian Consulate is due to be opened in Jeddah, Saudi Arabia. Considering the current economic climate, it is projected that the Maldives’ economic growth rate can be sustained at 7.6 percent this year. Similarly, it is estimated that average inflation can be contained at a rate of 1.3 percent. At the end of 2018, the foreign currency reserve of the Maldives amounted to USD 757.8 million. This amount is forecasted to increase to approximately USD 803.4 million towards the end of this year. The usable reserve was USD 281 million by the end of 2018, which is equivalent to the sum of nearly three months of imports. As of today, the Usable Reserve of the Maldives has risen to USD 308 million - the highest that our usable reserve has been since 2012. The Government strives to actualize substantial and sustainable economic development, and to this end aims to raise our foreign currency reserves to USD 1 billion by the end of the presidential term. God willing, we shall reach our target. According to the State’s financial statistics, the State received MVR 21.7 billion in grants and revenues by the end of 2018, while public expenditure was at MVR 25.5 billion. Hence, at the year’s end, the budget for 2018 was at a fiscal deficit of MVR 3.8 billion. The total public debt was MVR 47.9 billion, which was 58 percent of GDP. State revenue for this year is estimated at MVR 23.3 billion. In comparison to 2018, this is an increase of 7.8 percent and would significantly comprise tax revenue. Our aim is to increase the amount in annual revenue to MVR 30 billion by the end of my 5-year Presidential term. This year, a number of Islamic monetary policy instruments will be introduced to further enhance our monetary policy. Under the ‘Blue Economy’ vision of the Government, we envision spearheading brand new projects aimed at increasing national productivity, while maintaining the current level of expenditure on urban development and expediting projects in the pipeline towards completion. In formulating the Government’s economic policy, there are a number of things that need to be realigned. Small and medium-sized enterprises have been in cutthroat competition with much larger public companies and were increasingly being hindered or pushed out of business. Exploitation of the principles of Corporate Governance has resulted in gross mismanagement, leaving many organisations in desperate need of amelioration. Due to escalating expenses and debt, and projects in gridlock, the financial health of many of these companies have progressively deteriorated. The Government envisions a favourable environment for small and medium-sized enterprises to flourish, one where such enterprises would be able to provide basic services, have the capacity to undertake ambitious development projects and are free of destructive market competition from larger companies. In that regard, efforts to restructure companies are currently being undertaken. The SME Development Finance Corporation, established last month to elevate small and medium-sized enterprises, will start issuing SME Loans from next month. Upon gaining a banking license this year, the corporation shall be a functioning bank. An Exports Council has been enacted to help seek access for Maldivian products to foreign markets at competitive prices. This council will facilitate easy access to foreign markets for fisheries and agricultural products. I do not believe that developmental aspirations should be undertaken by the Government alone. Non-partisan private companies are far more predisposed to envisage developmental progress. A system is now in place whereby private parties may propose and run developmental projects alongside the Government. Establishing a conducive environment for business where investments are protected, with the aim of broadening private sector participation in the nation’s development, is one of our policy goals. Reforming the national tax regime, to transform it into an apparatus that encourages business growth, is an initiative that has been kick-started by the Government. A new company, “Government Fund Management Corporation” will be created this year to amass and manage funds to facilitate national development projects initiated by private parties. Through this company, financing for island development projects long stuck in the pipeline will be facilitated. The Government gives utmost precedence to providing equal services to all. From April onwards, staple foods will be available in all the islands at the same prices as in Male’. The price of staple foods available for purchase in the islands will thus be reduced. 70 percent of Maldives’ entire economy is comprised of the tourism sector. By the end of last year, 1.4 million tourists from around the world visited the Maldives, and there were 145 resorts and 521 guest houses operating with a total of 44,860 beds. 20 new resorts will be opened this year increasing the number of beds to over 47,000. The Government aims to attract around 1.5 million tourists to the Maldives this year. Under the Government’s plan, marketing campaigns are underway to further enhance Maldives’ exposure in foreign markets and increase the number of tourist arrivals to 2.5 million per year by the end of my five-year term. This year, we will embark on an initiative to capitalize on the distinct features of each atoll. Tourist destinations will be developed and divided into zones, with marketing strategies focused on informing tourists of the singularity of these zones, allowing for tourism to flourish across the country from North to South. Our economic progress and tourism industry are inherently tied to the ongoing project to develop and expand Velana International Airport. The need to improve the services currently offered, and to expand the capacity of the airport is paramount to accommodate the increasing number of tourists and travellers. Every year, many more resorts and guesthouses enter the tourism sector. The slow progress of the development of Velana International Airport relative to the rate at which the tourism sector is expanding, poses a persistent challenge to the sector and curbs its optimal performance. Without the completion of a new terminal, we can neither realise the full potential of the new runway at the airport, nor bring more tourists in. The Government has therefore deployed relevant resources to accelerate the development of the airport. The capacity and operation of the international seaport in the Maldives needs to be developed, alongside Velana International Airport. Given that the Maldivian economy is largely import-oriented in all areas, the narrow capacity of the Male’ Commercial Harbour causes many hindrances to businesses. As such, a modernized port facility in Thilafushi, offering efficient storage and logistical facilities is being planned, and God willing, the construction for which will begin later this year. Warehouses and industrial facilities will be moved to Thilafushi when construction is completed, significantly ameliorating congestion in Male’. In line with the 100 working days’ plan, Government Ministries have commenced work on facilitating ease of access for fisherman and farmers to financial services, bank loans and credit schemes. The import duty levied on diesel has been eliminated for fishermen as part of the Government’s policy to elevate the standard of living of families dependent on fisheries. Import duties levied on some 158 agricultural tools have also been eliminated. MIFCO is in critical need of renewed strategies to boost its efficiency and returns and, in turn, increase the overall earnings from fisheries activities. The Government is planning to reduce the export of frozen raw fish from MIFCO while focusing on exporting value-added processed fish cans of greater quality. The fish processing facility established by MIFCO in Hulhumeedhoo, Addu Atoll will be completed this year and will begin operations. Ice plants will be installed in a number of other islands and the capacity of Felivaru Cold Storage will also be expanded. National development in its true essence is measured by an increase in living standards. The Government aims to ensure that wages are sufficient for citizens to lead dignified lives. In this regard, the Government is presently engaged in discussions with relevant authorities to determine a minimum wage. In comparison to years past, the economic growth rate of our country has gained significant traction following the introduction of the tax system. The growth and sustainability of our ‘Jazeera economy’ is tied to increasing public profit from net economic revenue. As a means to overhaul the tax system, the Government intends to submit to this esteemed Majlis during the course of this year, a bill on introducing a progressive income tax. Once the bill is passed, the income tax regimen will be enforced next year. This will be another step towards a fully-functioning Jazeera economy. While much of the world is connected through digital technology, the Government is working to ensure the benefits of this technology reach as many citizens as possible. The Government aims to expedite the utilisation of digital communication services through the expansion of high-speed internet services to as many islands as possible. The digital divide presently inherent within the population must also be narrowed and digital mediums would be increasingly relied on to provide government services. Hospitals, health centres and health posts are now integrated into a singular digital network making service delivery more efficient. A similar transformation has been brought to the education system. An educated young generation is the most effective and guaranteed pathway to development. Maldivian youth will have the option to pursue tuition-free first degrees in the country before the end of this month. Education is apportioned the greatest amount for this year’s budget as an added measure to accelerate our development journey, which is equal to MVR 3.4 billion. This is the largest allocation for education in the national budget in the history of the Maldives. This Government is committed to providing higher education opportunities for the youth. Universal education will be guaranteed and with this, job opportunities will be expanded. The interest levied on loans to undertake studies abroad has been reduced from 5 percent to 3 percent and the duration for loan repayment has been extended by 25 percent. Following this revision, students who applied for loans at the topmost tier will have to pay approximately MVR 4000 less than the current monthly loan repayments. The above-mentioned loan scheme with the lowered interest rate will be applicable to those who met the requirements of the loan scheme announced by the previous government last year. More loan opportunities will be opened in the near future. The loan scheme includes doctoral degrees, and students may pursue their studies in SAARC countries as well as Malaysia, Thailand, the Philippines and China. On the first day of this academic year, student breakfast programs were piloted in 25 schools in the Maldives and the program will be extended to 213 schools at the start of the second term this year. Under the Government’s policy to ensure an education that is comprehensive and well rounded, classes are held for one session daily in 144 schools. A similar transformation is in progress for another 69 schools, where a feasibility audit is in the works to identify the facilities necessary to change school hours to a single session and plans for operationalization are being fleshed out. 580 local teachers were hired this year as part of the Government’s pledge to increase job opportunities for Maldivians. 7627 teachers are currently employed in Maldivian schools. Over 600 teachers are due to graduate this year from the Maldives National University and this will be a milestone towards the Government’s pledge to increase the number of youth working in the education sector. No amount of money or resources is sufficient in itself for national development. National development is also contingent on a healthy population. Human development is influenced by physical and mental well-being. Self-induced health risks and the prevalence of lifestyle diseases are the greatest threats to the overall health and well-being of Maldivians. Unhealthy foods and habits that compromise health are some of the main culprits of poor health in an alarming number of Maldivians. Tobacco and tobacco products make one highly susceptible to a host of lifestyle-related illnesses. Effective from 31st May, World No Tobacco Day, in accordance with the regulation on graphic health warning labelling on cigarette packs, the sale of individual beedi, cigarettes and cigars will be banned. The annual increase of the number of children diagnosed with thalassemia is a severe challenge to the health sector. The necessary facilities to take the serum ferritin test, which determines the level of iron stored in the blood, will be introduced in all atolls this year. To mitigate the increasing number of women diagnosed with cervical cancer, the HPV vaccine will be administered from this year onwards to girls between the ages of 9 and 13. Moreover, preliminary work to establish tertiary hospitals in the North and South as pledged is ongoing. The National Mental Health Centre will come into existence this year. This centre will provide treatments covered by Aasandha for mental illnesses. The facilities for the centre are being set up in Indira Gandhi Memorial Hospital. The Mental Health Bill outlining the formation of this centre will be submitted to this esteemed Majlis this year. Government institutions are working tirelessly to mediate arrangements for Maldivians to access Aasandha services from selected hospitals in India and Sri Lanka, the two main countries most frequented by Maldivians, as well as Malaysia, where a large number of Maldivians reside. The service will become available for Maldivians residing in Sri Lanka from first April onwards. The Government is further working on building a home for elderly citizens who do not have caretakers and have to fend for themselves. An active lifestyle is the key contributor to wellness. 200 new positions have been added to the Civil Service Act, as per our pledge to place sports counsellor in each inhabited island to foster active healthy lifestyles. Sports promotion is an important step towards building a generation of healthy youth. In an effort to promote national sports, the Government has resolved to provide a minimum yearly assistance of MVR 500,000 for each sports association. Men and women in national sports teams will receive equal allowances. The land required to build an Olympic size pool will be allocated in the Male’ area. A total of MVR 18 million will be spent on building the pool, and God willing, the physical infrastructure work of the pool will commence this year. This is exceptionally good news for promising young athletes targeting international awards. Despite the increase in GDP per capita of our country, the increase in purchasing power of individual citizens is negligible. Many islands are still without basic facilities. The provision of clean drinking water and installation of sewerage systems in those islands will be initiated this year. By the end of the five-year term, these services will be provided to all inhabited islands on an equal basis irrespective of the size of population. The most prominent part of the natural riches that the Maldives is blessed with, is our environment. To preserve the tropical beauty of the Maldives and safeguard the archipelagic nature of our island nation, the Government will give special priority to protecting our natural environment. The Maldives comprises oceanic atolls, and for that reason, its survival depends on the resilience of the seas, reefs and coastlines. It is our collective responsibility to protect our islands and guarantee their survival for posterity. Our development plans and policies must centre around preserving our naturally beautiful nation. Our natural resources must be preserved to ensure that our habitat is safe and resilient. We shall make our mark on the international arena again as a leading champion of the environment. The tax revenue accrued by the State from the green tax will be channelled via a Green Fund to initiatives protecting the environment, providing clean drinking water and managing waste. To reduced reliance on fossil fuels to generate power, and shift to renewable energy sources instead, solar power projects will be implemented in 82 islands this year, doubling power generation from renewable energy sources. The Maldives has a rich heritage and a culture. The Government will submit to this esteemed Majlis a bill on the legal protection of our heritage and culture this year. Local councils will be empowered to monitor historical monuments and museums housing historical artefacts. God willing, documentation of heritage and culture with the help of state-of-the-art technology will begin this year. A “Housing Needs Assessment” is currently ongoing to pave the way for an equitable and solid solution to the lack of proper housing. Following the needs assessment, an overarching national policy on housing, targeting the entire country will be formulated and implemented during this year. Preparations are afoot to open the bidding process for the construction of 550 new housing units. In addition to that, the construction of more than 1500 units of housing that had been halted has reconvened. God willing, construction works of extra 4000 housing units in Hulhumale’, for residents of Male’ will convene this year. The “Hiya” project of the previous Government is problematic in itself and rife with serious challenges, involving those that were presented certificates of receipt while many who scored much higher points did not qualify. Apart from these issues, discrepancies around housing projects, including the Gulhifalhu project, will be settled. Furthermore, the drafting of two more bills on housing and shelter is ongoing. These include the Tenancy Act that outlines the regulations by which housing and apartments may be given for rent, and the Condominium Act that outlines the regulations on the sale of condominiums. The Government is planning on bringing all housing projects across the Maldives under one roof, the National Housing Corporation. The purpose of this new company, when established, will be to provide affordable housing at significantly lower prices than what was previously offered. To provide affordable air transport for all Maldivians, the fares for domestic flights of Maldivian Airlines have been lowered by 25 to 30 percent. Arrangements to introduce environmentally friendly mini buses in Male’ has commenced. This will help to overhaul the public transportation system in place and improve road safety for pedestrians. Congestion in the capital, Male’ is a significant challenge that affects the quality of life of citizens. Substantial changes will be made to eradicate congestion in Male’ and transform it into a peaceful and safe place for those who reside in and visit the city. The Government has resolved not to initiate any new construction of public buildings in Male’. Selected sections of Male’ will be cleared where people of all ages may enjoy Jazeera Maldives at its best. Freedom of the press, an institution which holds up a mirror to the Government on its performance and holds us to account, was shackled by the anti-defamation law when I assumed office. With the grace of Almighty Allah, I have now repealed this draconian law and the press are free to go about their important work. The purpose of the Government is to serve the people. The State takes its form in every country only when the Government and the people coalesce in running the Government. Hence, the survival of the Government is contingent on the extent to which individual responsibilities are undertaken. I would like to reaffirm my assurance to the honourable members of this Majlis, that I am adamantly committed to fulfil the expectations the people have of me. My resolve on the day of my inauguration, to be of service to all Maldivians, regardless of their political views on Election Day, remains intact. As it so happens, the noble obligation to secure and defend the rights of the Maldivian people has fallen upon my shoulders today. May Almighty Allah bestow upon me the strength to carry out the obligations of my Office and realise the aspirations of the Maldivian people. And with that, I earnestly hope that I can count on the unwavering backing of the esteemed members of this Majlis in this endeavour. ● for us to be guided on the righteous path of Islam by the grace of Almighty Allah. ● for the blessings of perseverance in containing our love for our nation and in observing our national duty to uphold the sovereignty, unity, peace and harmony of our nation. ● for the blessings of wisdom and aptitude to elevate our beloved nation to new heights of development. ● for us to be blessed in our endeavour to consolidate the practice of good governance and in our reform efforts. Aameen.